It looks like DiGi too is offering a special discount of an additional RM200 (no not SKMM rebate) when you sign up for a phone bundle for selected devices, and not just older devices, but new ones as well namely the Samsung Galaxy S4, Note II, HTC One and BlackBerry Q10. 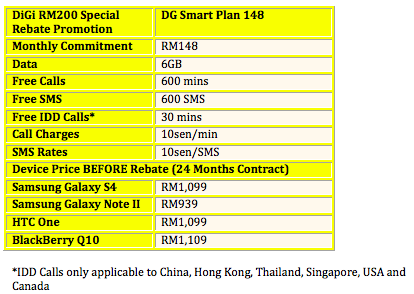 Applicable only for DiGi’s loyal customers – those who have subscribed to DiGi for 12 months or more with an average bill of RM100 and above for the past 6 months – the promotion starts today, 1 August 2013 and will go on to 15 August 2013. Do note that the RM200 rebate is only available with device contract sign-up on DG Smart Plan 148, and it ties you up to a 24 months contract so if you’re a very heavy mobile user , go for it. DG Smart Plan 148 comes bundled with 600 minutes of calls, 600 SMS, 30 minutes of Bundled IDD Calls, and different devices comes with different additional freebies. The offer is only available at DiGi stores and DSS nationwide only; not available at DiGi Store Online (DSO) at the moment. Visit DiGi for more information about the promotion.